The approach works well, for the most part, but it does mean that the lush growth and pretty combinations of late spring end up looking really rough after the pruning frenzy. The hybrid bluestars (Amsonia) above, for instance, were barely finished flowering when I got around to that part of the garden, and it was the work of a few minutes to chop them and the lamb’s ears. If I’d left them alone, that area would have looked lovely for another 4 to 6 weeks, at least. But I know from experience that if I didn’t give it some tough love now, the bluestars would be all floppy and the lamb’s ears would have been smothered or rotted by mid-July and look bad for the rest of the season. So, needs must, and all that. I’ve been taking lots of pictures anyway during the last few weeks, and when I reviewed the images a few days ago, I realized that there are some good things going on out there. Really wonderful things, actually. So, forgetting about all the excuses, I present the highlights of early summer at Hayefield. Now, how to arrange the best moments? By color, I suppose, so let’s start with the abundance of pinks. Below is more crosswort, this time with Mexican feather grass (Stipa tenuissima) and ‘Dark Towers’ beardtongue (Penstemon)—well, one ‘Dark Towers’ and a bunch of its seedlings, many of which look just like the original. 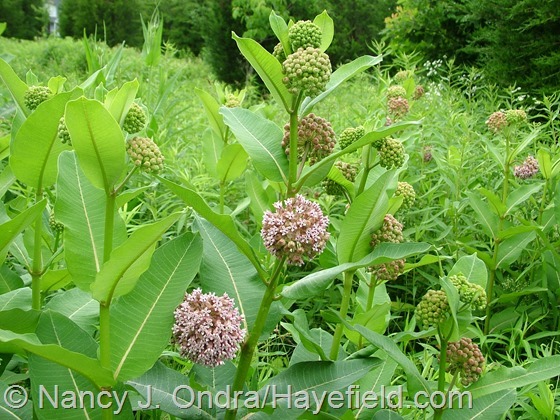 Out in the meadow, the common milkweed (Asclepias syriaca, above) is coming into bloom, about 10 days after the showy milkweed (A. speciosa, below) started in the garden. 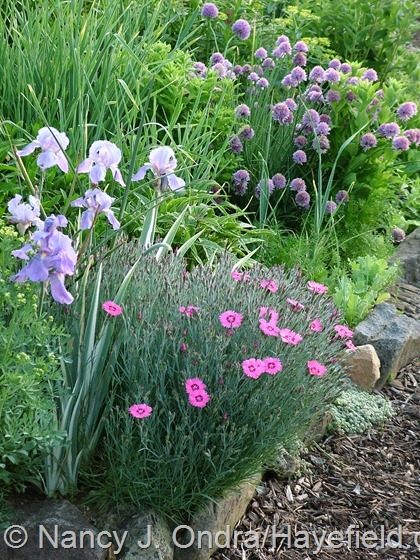 Above, ‘Pixie Star’ pink (Dianthus) with ‘Argentea Variegata’ sweet iris (Iris pallida) and chives (Allium schoenoprasum). 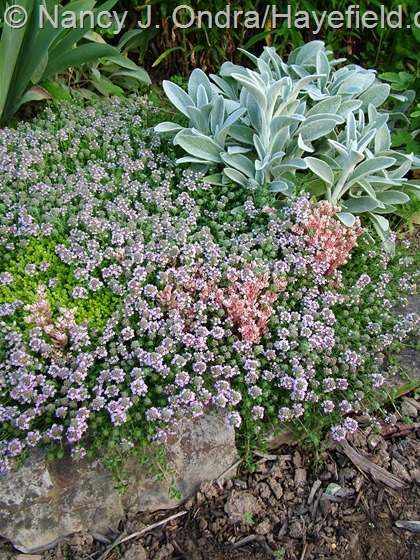 Below, lamb’s ears (Stachys byzantina) with creeping thyme (Thymus serpyllum), Sedum hispanicum var. minus, and what came labeled as Sedum acre, though it’s much tinier than the stringy, rampant spreader I’ve grown under that name. 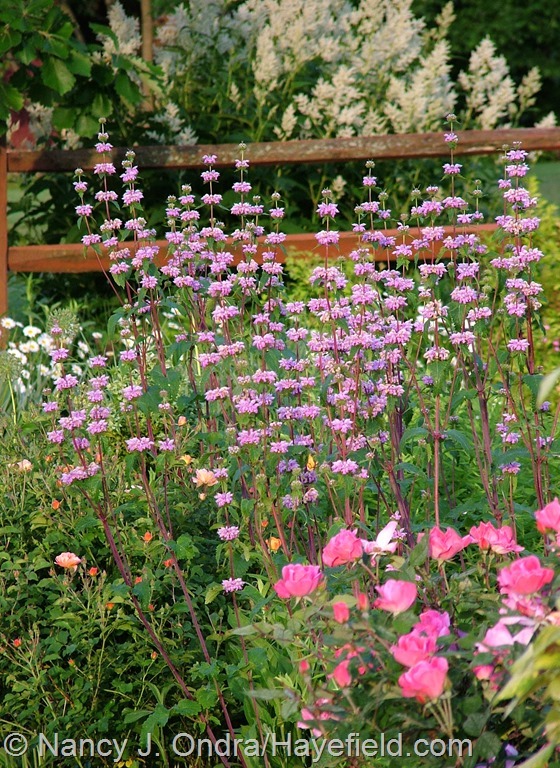 Above, ‘Amazone’ tuberous Jerusalem sage (Phlomis tuberosa) with Pink Knock Out rose (Rosa ‘Radcon’). And below, blue-leaved rose (Rosa glauca). Wow—that’s really bright! 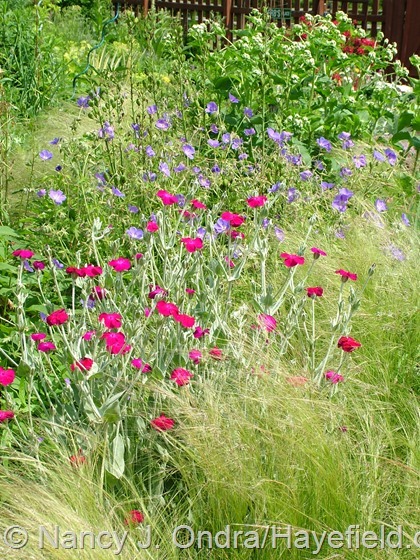 There’s rose campion (Lychnis coronaria) mingling with Geranium ‘Brookside’ and Mexican feather grass (Stipa tenuisssima). 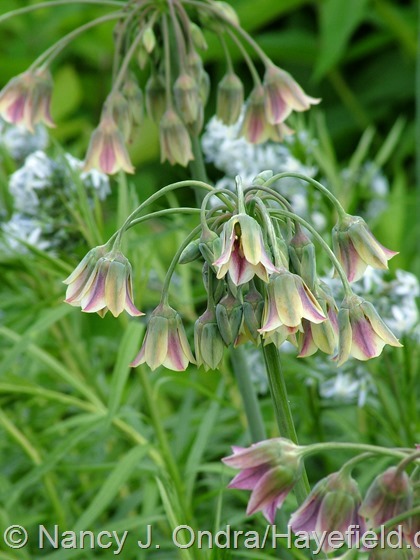 Let’s cool things down again before we leave the pinks, with Sicilian honey garlic (Nectaroscordum siculum). Now for the whites. 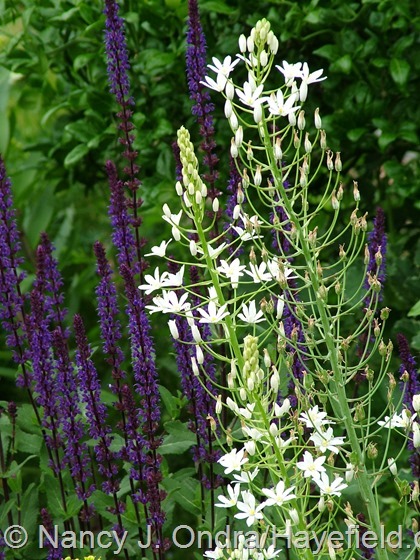 Above is Ornithogalum magnum with Salvia ‘Caradonna’. 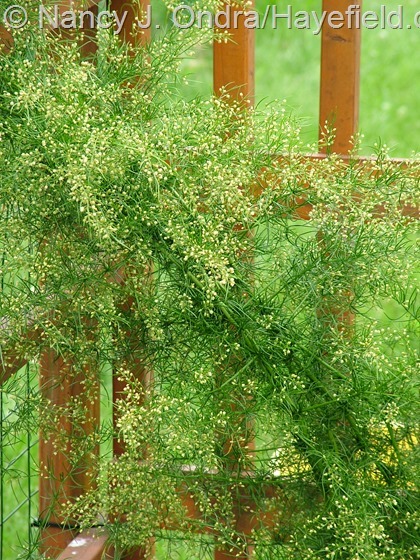 Below is climbing hardy asparagus (Asparagus verticillatus). It’s a hard plant to take a good picture of, because it’s so wispy, but it’s really cool up close. I’ve had to move this clump several times in the last 10 years, and it hated it each time. It’s been in this spot for about 4 years now, though, and it’s finally settled in; right now, it’s about 7 feet tall. Above, wild quinine (Parthenium integrifolium) is just starting its months-long bloom period. 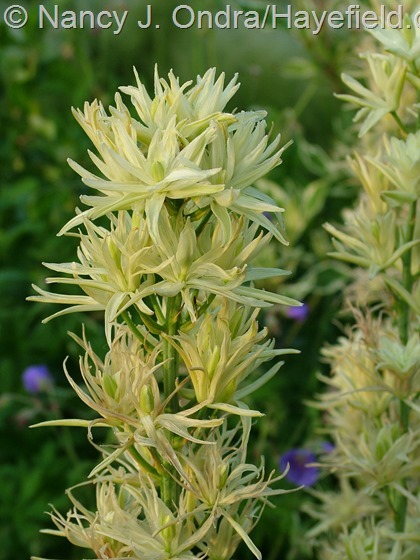 Camassia leichtlinii ‘Semiplena’, below, blooms for only a week or so, but it’s very pretty too. 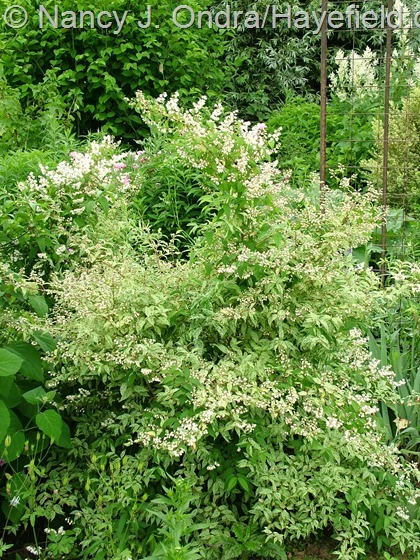 Above, variegated rough deutzia (Deutzia scabra ‘Variegata’): an excellent example of why it’s pretty much pointless to have white flowers on a white-variegated plant. But then, the bees certainly don’t find the flowers to be pointless. Below, the first flowers on ‘Governor George Aiken’ mullein (Verbascum), seeds of which came to me from one of my readers in Vermont (thanks, Alice). 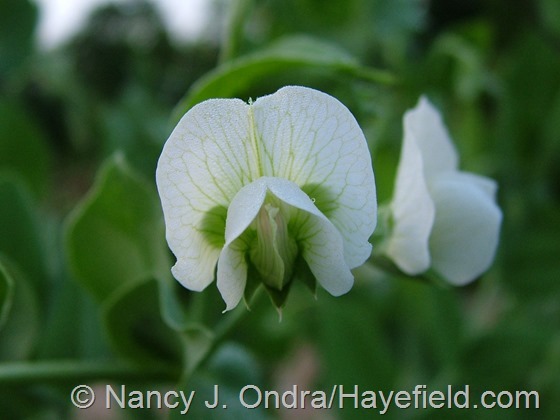 Below, beautiful blooms that would probably be prized if they were on a rare plant instead of a relatively common snow pea variety (‘Mammoth Melting Sugar’). 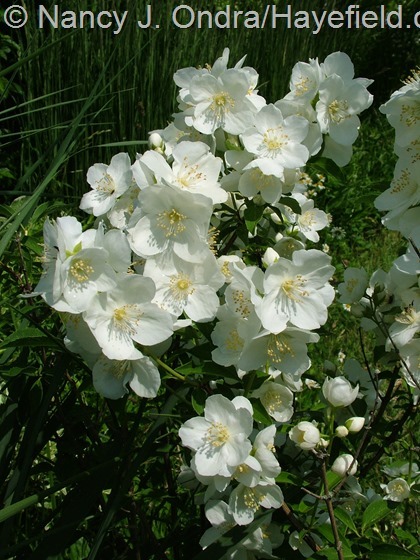 Above, ‘Innocence’ mockorange (Philadelphus), which flowers about 2 weeks after P. coronarius. Sometimes, weeds serve a purpose. These oxeye daisies popped up in a difficult spot in the front garden, and they showed off so nicely in front of the ‘Fiesta’ forsythia that I decided to leave them—for a while, anyway. Above, a vignette from one of the beds in the shrubbery, of ‘Henry’s Garnet’ Virginia sweetspire (Itea virginica) with foxglove beardtongue (Penstemon digitalis). 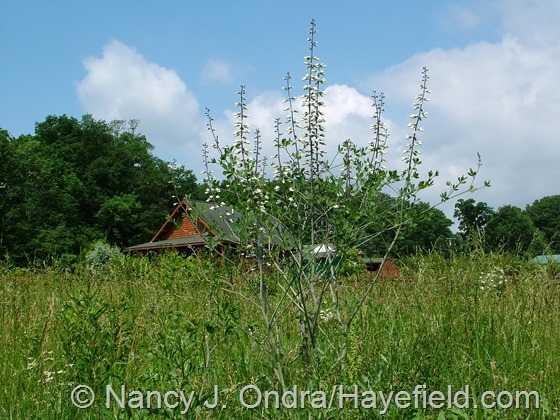 Below, one of the white false indigo (Baptisia alba) clumps in the meadow on the sand mound. The other baptisia species I grow here are done by this time, but these have just started flowering because I mowed the whole area to 4 inches in mid-April, so they got set back a bit. 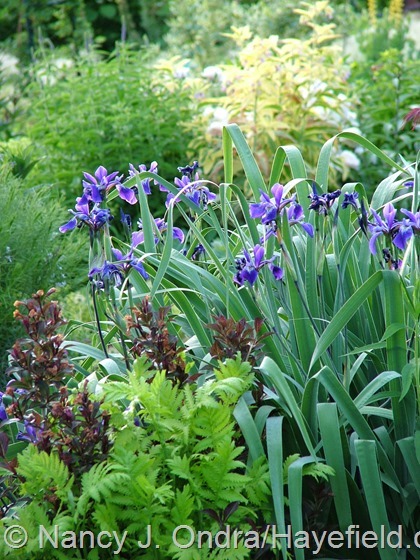 Getting into the yellows, with ‘Butter and Sugar’ Siberian iris (Iris sibirica) above and rue (Ruta graveolens) below. 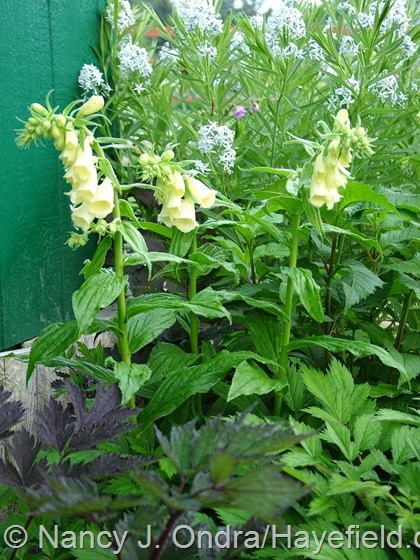 Above, yellow foxglove (Digitalis grandiflora) against a hybrid bluestar (Amsonia); below, king’s spear (Asphodeline lutea). 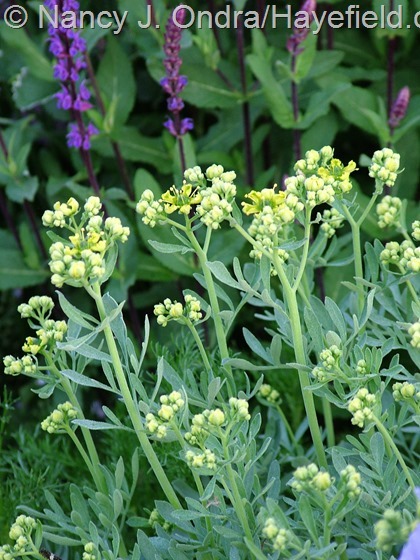 Two chartreusey, self-sowing annuals: above is hare’s ear (Bupleurum rotundifolium) and below is Euphorbia ‘Golden Foam’. 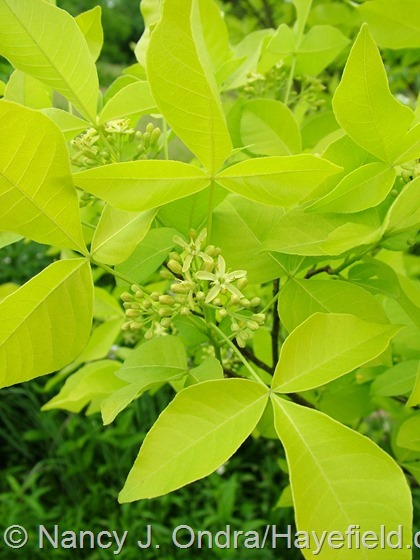 The beauty above—golden hoptree (Ptelea trifoliata ‘Aurea’)—also comes true from seed. Below, yellow meadow rue (Thalictrum flavum subsp. glaucum) with a lost-label hosta. 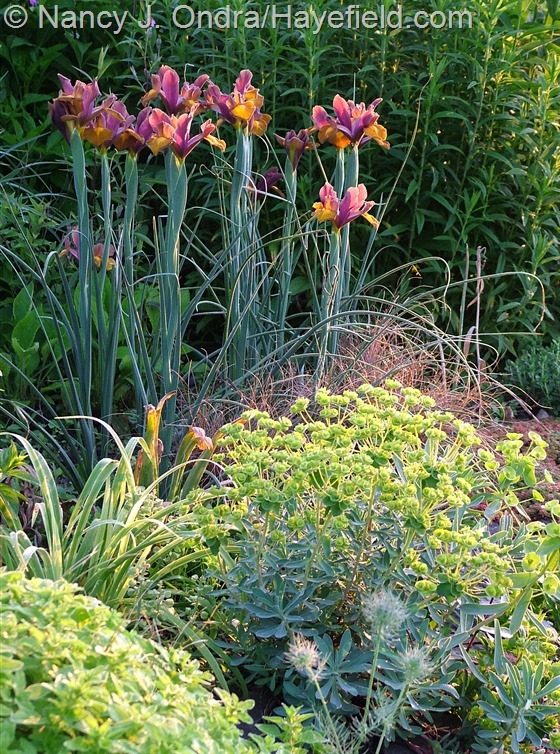 The flowers of ‘Lion King’ Dutch iris include both purple and orange, but I figured they could go here since they’re with yet another yellow (Euphorbia nicaeensis), and ‘Toffee Twist’ sedge (Carex) as well. Getting to the more distinct purples and blues, starting with a bunch of alliums. 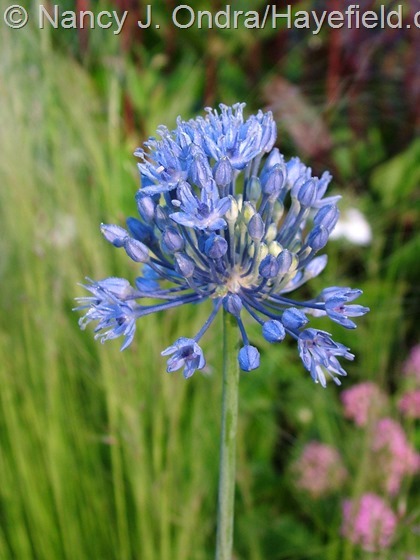 Above, blue globe onion (Allium caeruleum [A. azureum]); below, hybrid ‘Forelock’ allium just coming into flower. 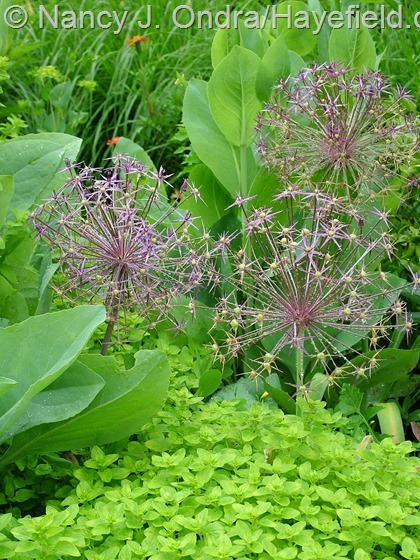 Above, star of Persia (Allium christophii) with golden oregano (Origanum vulgare ‘Aureum’) and giant coneflower (Rudbeckia maxima). 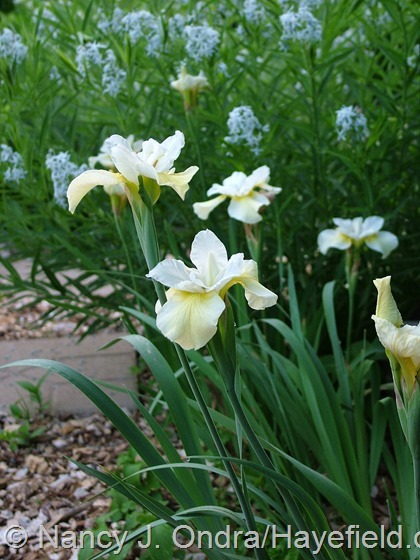 Below, hybrid ‘Gladiator’ with ‘Edith Wolford’ bearded iris. Several days in a row of 90+ degrees in late May fried many of the irises, but I figured I’d include this one of ‘Gerald Darby’ (Iris x robusta) for the folks who were so impressed by its purple foliage last month. Below, heartleaf speedwell (Veronica grandis), originally from Plant World Seeds. Gift seeds of an ornamental cabbage mix (thanks, Clark!) 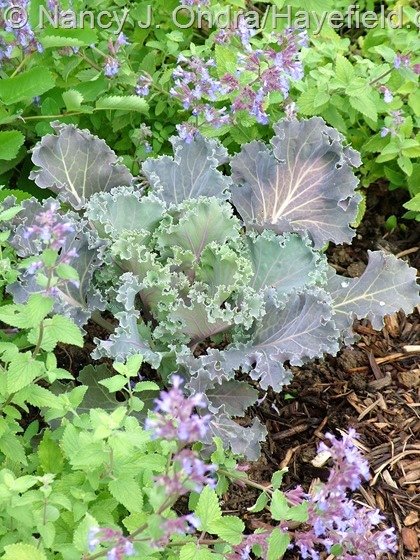 produced some really cool plants; above is one with ‘Blue Wonder’ catmint (Nepeta). 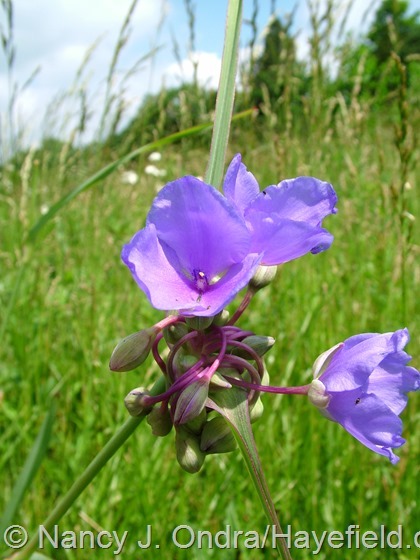 Below, one of a bunch of Canterbury bells (Campanula medium var. calycanthema) down in the cottage garden. Above, some Ohio spiderwort (Tradescantia ohiensis) in the sand-mound meadow. June is also the time for the leather flower clematis. 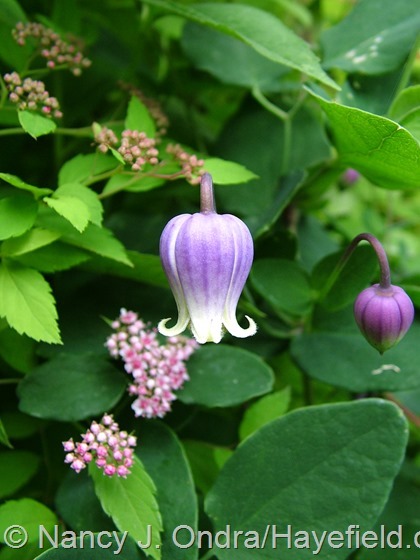 The one below is Clematis viorna. 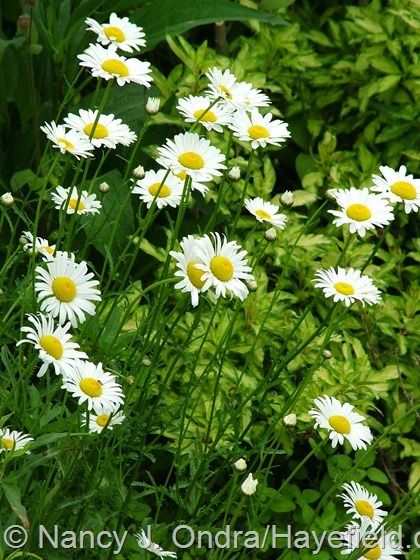 The flowers of these two look very similar, but the one above grows just 2 to 3 feet tall. I’m pretty sure now that it’s Clematis addisonii. 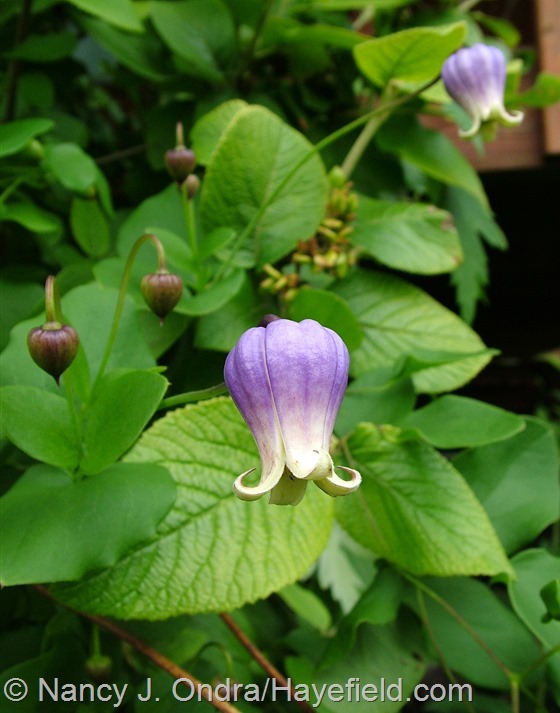 The one below, which I think is Clematis versicolor, grows 5 to 6 feet tall. 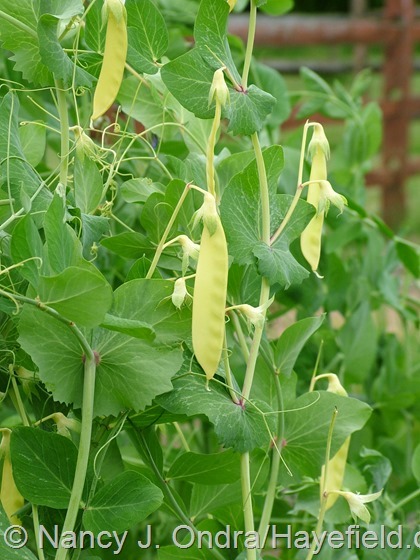 Not many edibles so far, but a few include ‘Pixwell’ gooseberries above and ‘Golden Sweet’ peas below. The 16th of every month is Foliage Follow-Up day, hosted by Pam at Digging. Since I never seem to get around to doing a separate post for it, I’ve included some of my favorite foliage shots here. Lovely Japanese painted fern (Athyrium niponicum var. 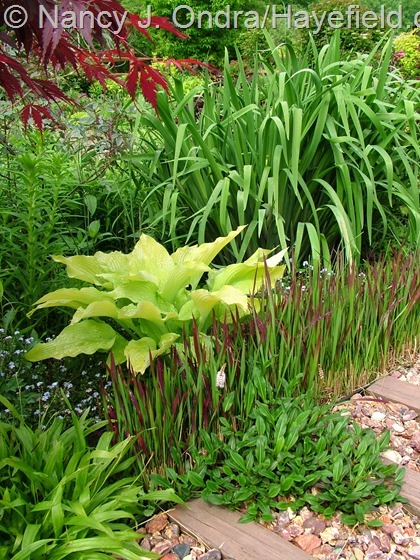 pictum), above with ‘Othello’ ligularia (Ligularia dentata) and below with feather-leaved rodgersia (Rodgersia pinnata), some Astilbe chinensis var. pumila, and a bit of ‘Hillside Black Beauty’ bugbane (Actaea/Cimicifuga). 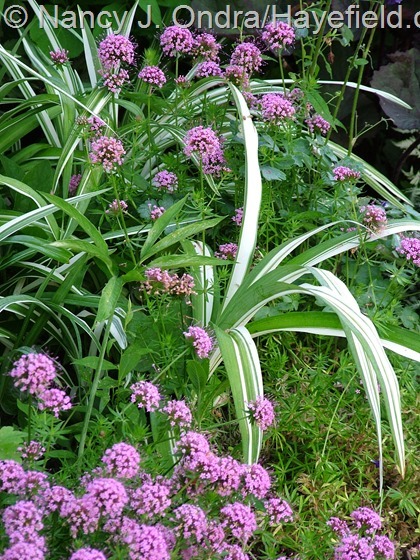 Above, Miss Willmott’s ghost (Eryngium giganteum) getting ready to bloom; below, ‘Big Ears’ lamb’s ears (Stachys byzantina) with ‘Voodoo’ two-row sedum (Sedum spurium) and a bit of an unnamed Japanese maple (Acer palmatum). Bits of the same Japanese maple appear in these two shots as well. 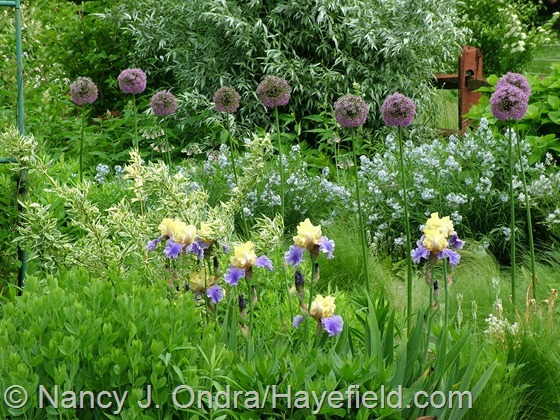 Above, it’s with ‘Gerald Darby’ iris (Iris x robusta), Japanese blood grass (Imperata cylindrica ‘Rubra’), dwarf fleeceflower (Persicaria affinis), and ‘Sun Power’ hosta. Below, it’s behind Wine and Roses weigela (Weigela florida ‘Alexandra’), Magic Carpet spirea (Spiraea ‘Walbuma’), ‘New Hampshire Purple’ bloody geranium (Geranium sanguineum), ‘Oehme’ palm sedge (Carex muskingumensis), and, out of focus along the right edge, the new growth of ‘Latifolia Maculata’ boxwood (Buxus sempervirens). 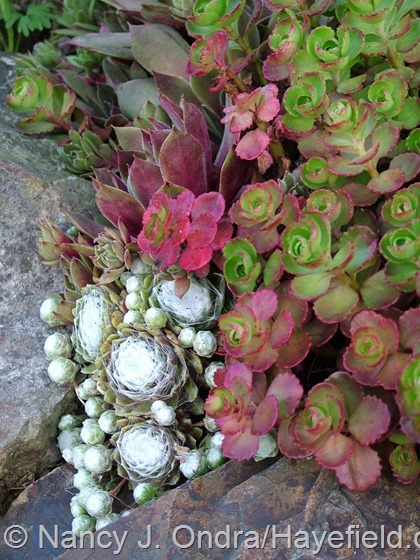 Above, ‘Elizabeth’ two-row sedum (Sedum spurium) with a variety of hens-and-chicks (Sempervivum). 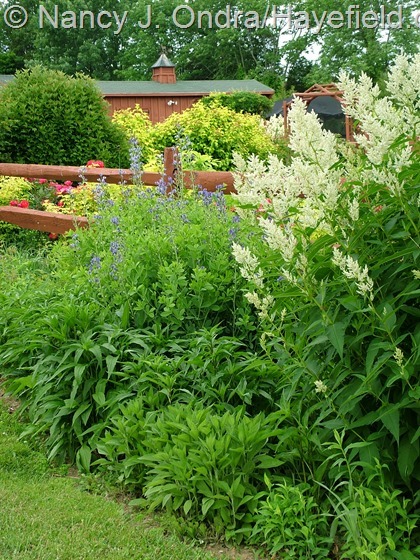 Below, variegated pokeweed (Phytolacca americana ‘Silberstein’) with golden meadowsweet (Filipendula ulmaria ‘Aurea’). 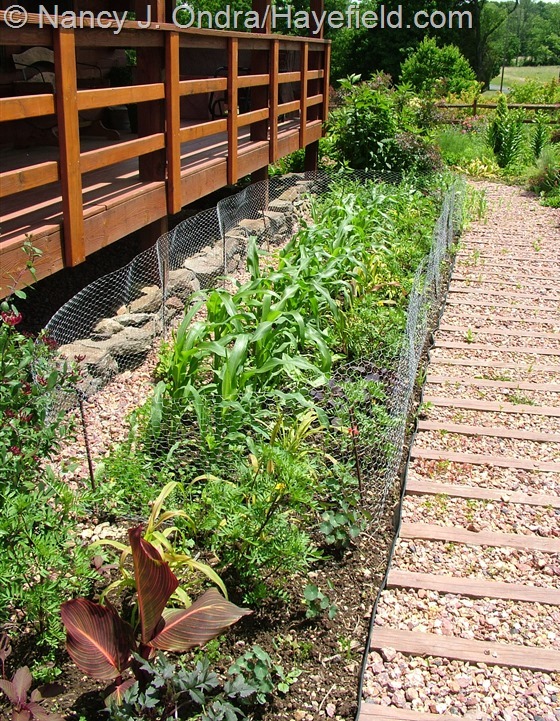 And a few general garden shots, starting with the shrubbery beds I worked on expanding last fall. 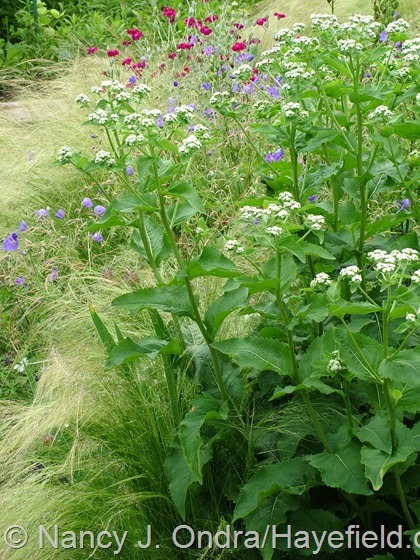 Part of the border out front, above, with the same clump of giant fleeceflower (Persicaria polymorpha) visible from the other side in the front-garden shot below. Lots of chartreuse (maybe too much?) in the front garden. And a couple of shots of the side garden. 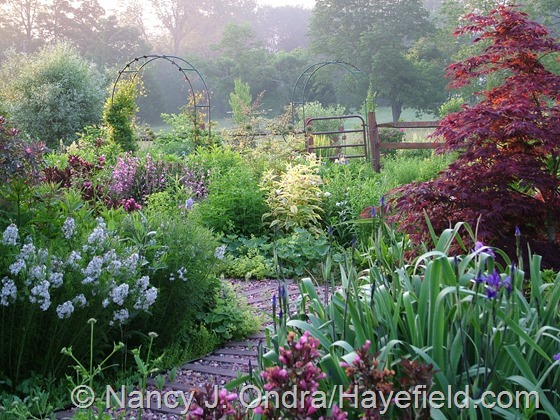 To see what’s blooming in other June gardens around the world, be sure to visit Carol’s main Garden Bloggers’ Bloom Day post at May Dreams Gardens. But before you go, I have two bits of blog business to mention. First, I probably won’t be doing a new post on the first of the month, as I usually do, so I can get caught up on some work deadlines. I’ll be back for Bloom Day on July 15th. Though I probably shouldn’t do this (talk about counting one’s chickens before they’re hatched! ), I can’t resist mentioning two new things I’m really excited about and looking forward to sharing with those of you who are interested. And thanks to one of my readers (you’re so generous, Rick), I was able to start a whole flat of the rare species Petunia exserta. 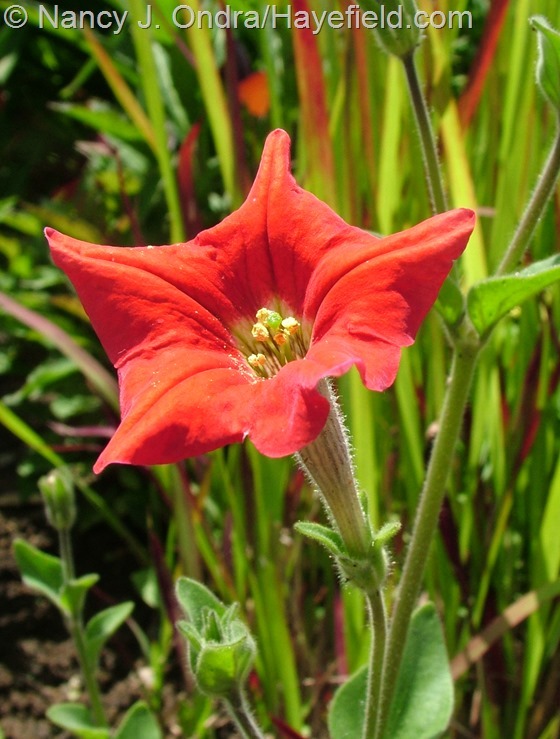 You can read more about this treasure here: Petunias Rare and Red. I’m keeping my fingers crossed to collect seeds of this one: it deserves to be enjoyed everywhere! Thanks for another of your lovely postings with photos Nan. Good luck with the corn and petunia both very beautiful and rare. 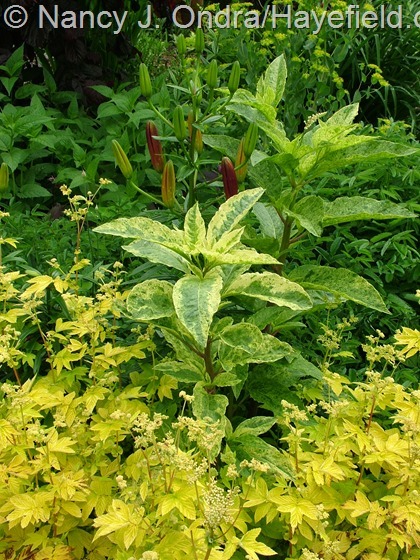 If I were to request any seed it would be from the variegated pokeweed and Golden meadow sweet, I have a thing about Gold foliage. God bless. I’m glad you mentioned those seeds, Allan. There’s usually plenty of the pokeweed, and it does produce variegated seedlings. I don’t know about the golden meadowsweet, because I’ve never let it go to seed, but I will refrain from cutting it back this year and see what I can get. I hope you and your garden are doing well today. Gorgeous, gorgeous, gorgeous. Your garden is amazing. I’m so glad you decided to share these great photos. I’ve been scrolling up and down, up and down for ages just taking it all in. Thanks, Bernieh! It’s a lot of scrolling, I know. Happy Bloom Day to you. You have so many lovely annuals. I know some of them must self-seed, but how many do you start in flats and plant out ? Direct sow? My perennials grow so much there’s no room left for annuals. 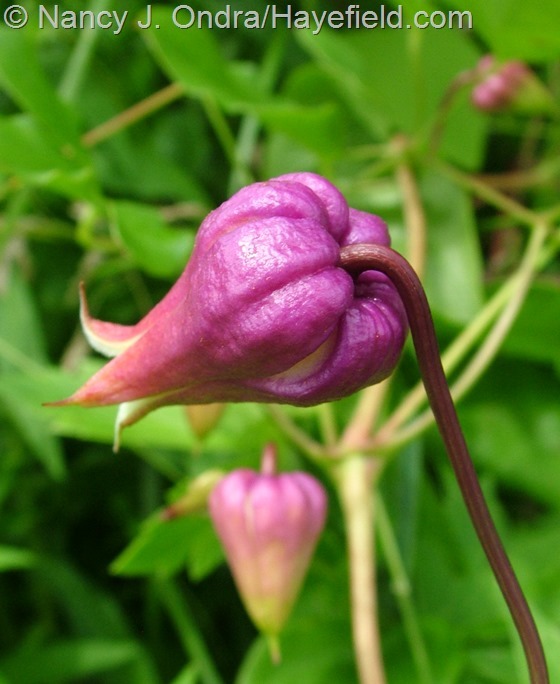 Love that clematis addisonii – such a lovely bell shape. Hmmm…I’d guess around 300 3.5-inch pots of various annuals from indoor sowing. I seldom have luck with intentional direct-sowing, but the self-sown seedlings supply lots of fillers. I know what you mean about the perennials. As you can see, the spaces I have left for annuals are getting smaller every year, so I occasionally remove some of the perennials to make more room. Nan, your gardens are always inspirational and provide some much variety. Thank you for joining in for bloom day so faithfully. Thank you, Carol. Like you, we’re a few weeks behind a “usual” spring here, but there’s still a lot of action despite the delay. Wow! I’m once again amazed at how well everything is put together in your garden. I grow a good number of the same things, but never in those splendid combinations. Also amazed at how much earlier your garden seems to be compared to mine, just 10 miles to the north. My Asclepias speciosa hasn’t even started blooming yet. Which reminds me: how do you cope with it in your garden? I only recently established it, and am already wondering if I should axe it for its aggressive wandering tendencies. Another thing that caught my eye: your Baptisia alba in bloom, along with the statement that you cut it back in mid-April. Mine don’t even bother showing themselves (year after year) until mid-May. Come to think of it, I haven’t seen mine yet this year. Maybe I finally lost them. In any case, thanks for the continued flashes of inspiration! 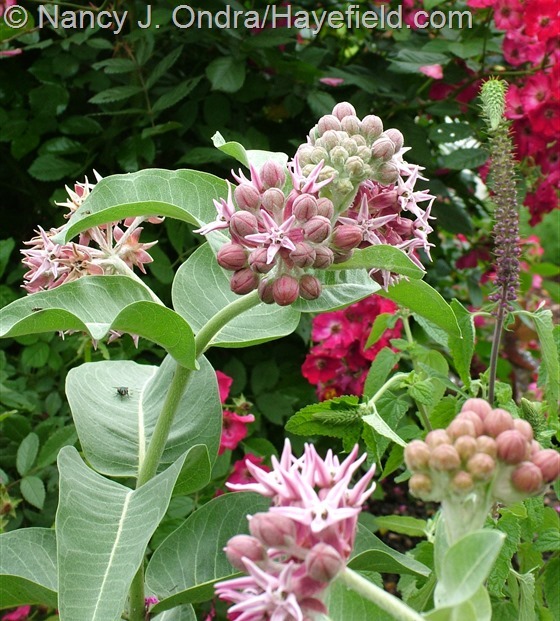 The Asclepias speciosa really is a wanderer, Rob, but here, at least, it’s only about 1 foot tall and doesn’t come up in thick patches, just here and there. I did try to get rid of it for a while, but it survived a complete renovation of the area where it’s growing, so I decided to live with it. I enjoy the bits that come up in good spots and pull out any that are in the wrong place, and we’ve been getting along all right that way. As far as the Baptisia alba…I usually do see the shoot tips around the time I do the spring mowing down there, so either they’re tall enough to get nipped by the mower or to get crushed when I walk over them, but they always recover. I suspect they come up early there because of the special conditions on the sand mound: it’s very well drained, about 4 feet above the surrounding grade, and in full sun all day. My other baptisias are usually well up by early May. Your gardens look lovely…as usual. It inspires me. We’ve had some really awful weather here in Ohio. I’m very behind in my planting. The pretzel bean seeds you sent are coming up. Can’t wait to see how they taste. I also have the South African foxglove growing too. I would love some seed from your crosswort. It’s been unusually cool and wet here too, Melanie – except when it’s been really hot and dry. Crazy weather. I hope yours settles soon, and that you have good luck with the pretzel beans and ceratotheca. I’m glad you reminded me about the crosswort: I will try to remember to not cut it back when it’s done. 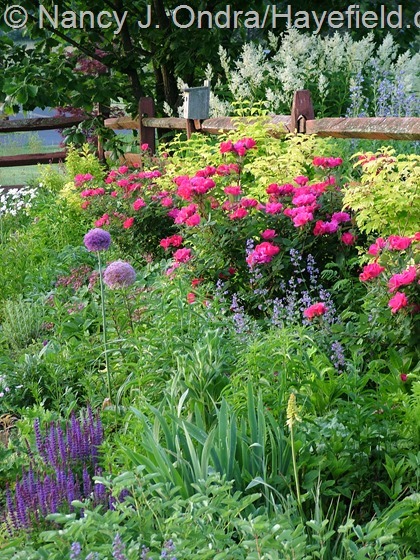 Your idea of a “paltry offering” really puts my garden to shame, looks great! The shrubbery borders seem to be growing nicely, I bet it’s a more relaxing part of the garden to stroll through compared to inside the fence (there’s so much excitement going on in there!)…. you have so many amazing photos posted this month, thanks. I love your new verbascum and the corn really is cool, also quite a story behind the petunia. Well, it turned out to be not so paltry when I actually looked at all of the photos I’d taken. Yes, I spent a lot of time working on the shrubbery beds last fall and in early spring this year, but there’s not much to do there this time of year except enjoy them. I look forward to sharing seeds of that verbascum, too; it’s even better now that more of the flowers are open. Have fun in your own garden; I hope the weather is as nice where you are as it is here today. That’s brilliant!!! It certainly does take a lot of work to get that “natural” look. 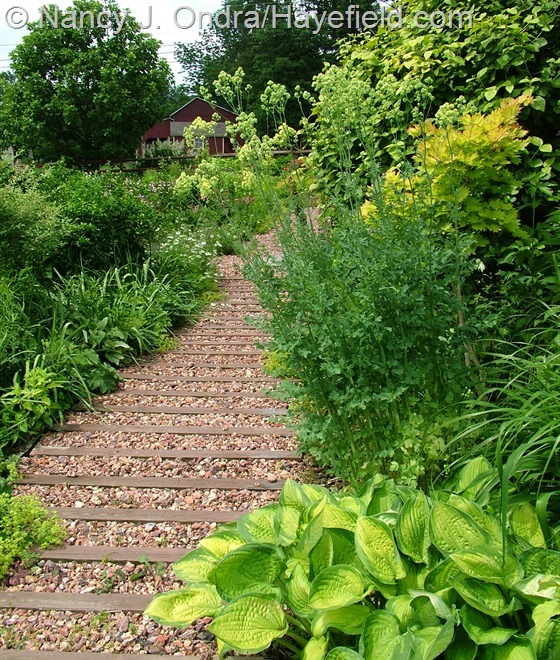 I love the garden path it is so interesting. I can’t wait to see how the corn turns out. I have read about it and seen pictures. How much time do you spend in your garden a day? It’s beautiful. Thanks, Cheryl! I try to get in about 3 hours of gardening in the morning and 4 at night, but as I’m working on a new book right now and editing someone else’s book, I’ve been lucky to get 2 or 3 hours a day to keep up with watering and weeding. 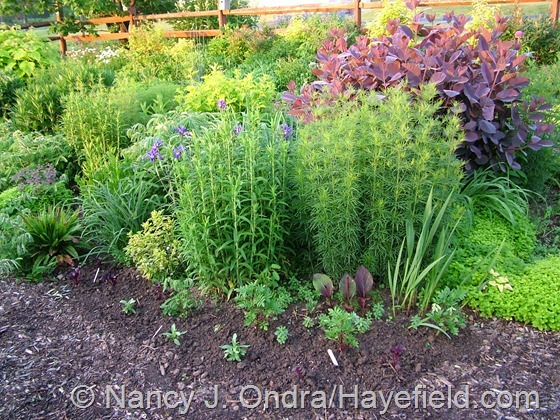 At least the planting is essentially done now – whew! This is definitely not a low-maintenance garden. Nothing to apologize for in this post. Inspiring as always. The Japanese painted fern against the Ligularia is superb! I could do that. Thank you Nancy for so much food for the soul. Hi Amy! That’s an easy but really pretty combination. 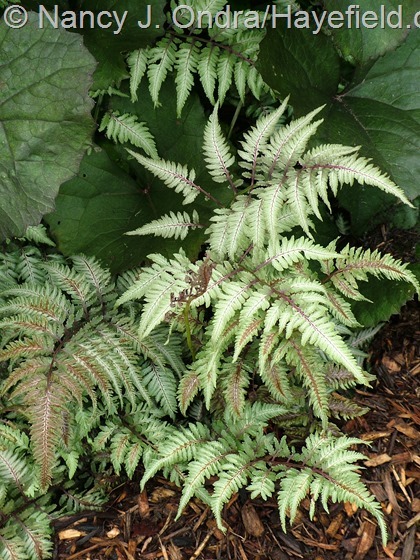 Both plants would prefer more shade here, but the soil is moist enough to keep the ligularia from wilting too much, and its big leaves provide some shade for the fern, so it works all right. I have a question on the japanese painted fern, I want to add it to one of my clients’s gardens but I don’t know much about it. Does it go dormant, and does it send runners? Thank you. It does die back to the ground in winter. 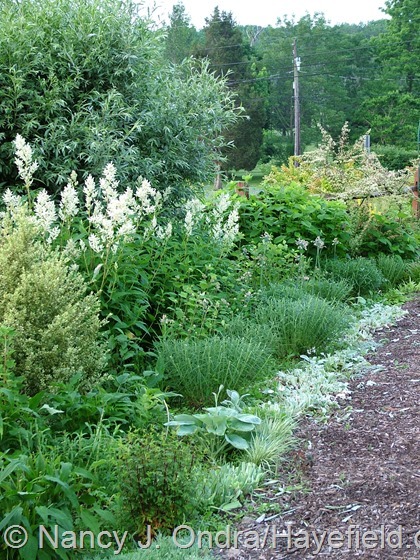 So far, mine has stayed in gently expanding clumps, but I understand that it can be a more aggressive spreader in some areas and growing conditions, so you’ll probably want to find out from other gardeners in your area how it does for them. Now that I’m starting to have luck getting it established here (finally finding some shade from taller plants), I’m looking forward to trying some of the stunning newer cultivars. But in the meantime, I’m really enjoying having this common one. So that’s what passes for paltry at Hayefield! And since you asked, I hope that Gov. George Aiken verbascum sets copious seed. I wonder how long it takes for Sicilian honey garlic to bloom from seed — probably best to buy bulbs, I’m guessing. Good luck with all your projects, Nan, and thanks for a spectacular BD post. Hah – paltry is what I expected; plentiful is what I ended up with, happily. If this mullein is like others, I should have plenty of seed to share if even just one of the eight plants makes it to maturity. 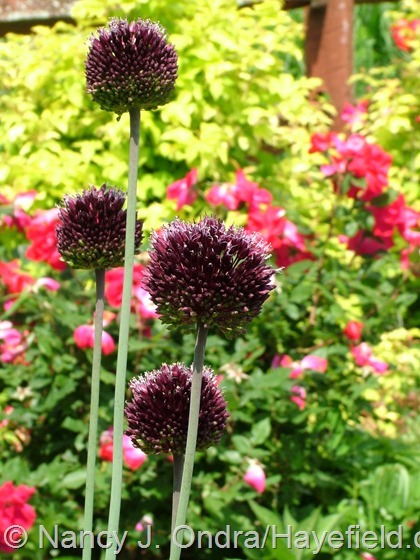 I’ve never had seeds form on the Allium nectaroscordum, so I’m not sure how hard it would be to raise it that way, but buying a few bulbs would definitely be quicker. Wow, what a difference to a couple months ago. Over her in UK our gardens are trying to catch up but still weeks behind, we are seeing flower and blossom combinations that have not occurred in years. 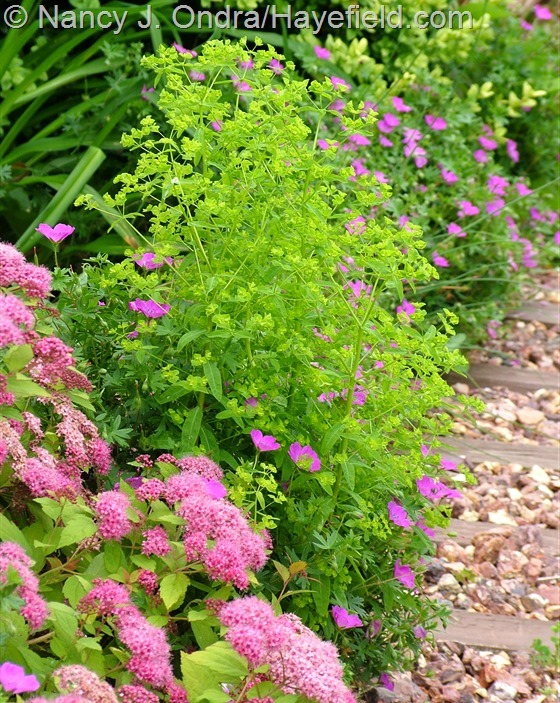 Your garden is so very beautiful and has some great combinations, what is your favourite early season combo? 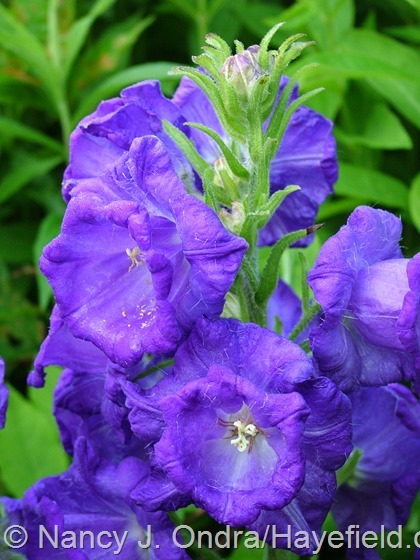 The verbascums look as though they will be real crowd pleasers and the petunias look very exotic. Hi there, Niah. Thanks so much for your kind comment. What an interesting observation about unusual combinations occurring for you this year. 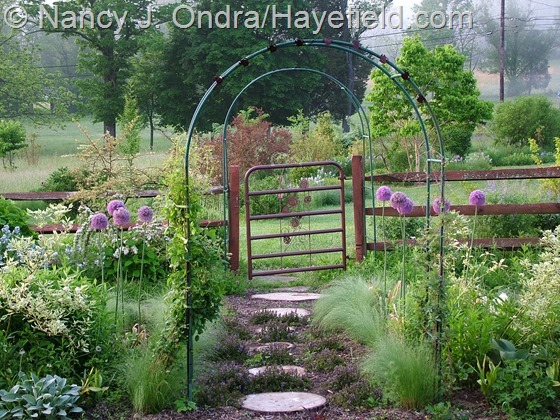 I don’t think I can choose one favorite grouping for this time of year, though I love pretty much anything with alliums, Stipa tenuissima, or Persicaria polymorpha (as may be obvious from the many photos that include them). Thank you, Marion. I guess June is kind to pretty much any garden (in this hemisphere, anyway), whether the gardener plans for it or not. Nan, I’m so thankful you have a blog, even if you can only post once a month. Your plant combinations are so inspiring. And I don’t think you can ever have too much chartreuse–it’s such a wonderful, fresh color. I’m with you, Heather! Apparently not everyone feels that way, though…one of my neighbors once asked “What’s with all the chartreuse?” I figured that if he had to ask, he simply didn’t understand the appeal. First off, Nan, no apologies needed, your garden look fabulous, as always! I’m glad to see someone else is smitten by Golden Oregano…I have to stop myself from buying more every time I go to the nursery! 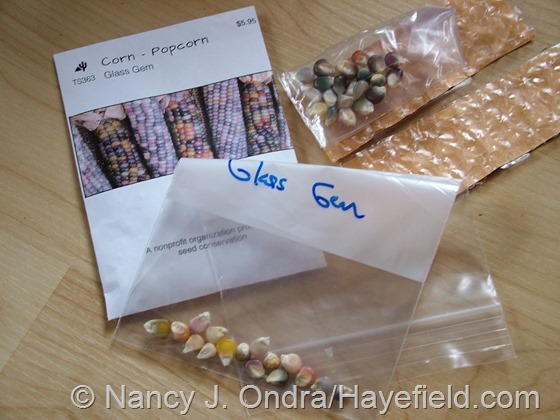 Congrats on the Glass Gem Corn…I have to admit, I’ve never heard of it, but it looks amazing. Oh, and your picture above made me decide once and for all that I WILL find room for Angelica! Happy Bloom Day! I know exactly what you are saying, Scott: I have so much golden oregano that I tear out lots of it each spring, but it’s soooo cute in little nursery pots that it’s all I can do to resist buying more. 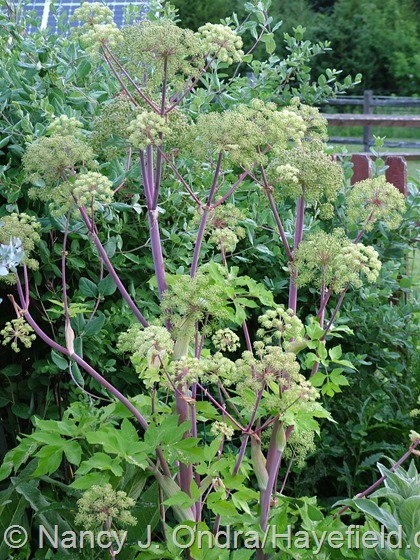 Good luck finding room for a clump of angelica among all your other gems. Maybe you could try the smaller A. pachycarpa instead, to get the cool flowers with the bonus of the fantastically glossy foliage? Stunning! There is no such thing as too much chartreuse. 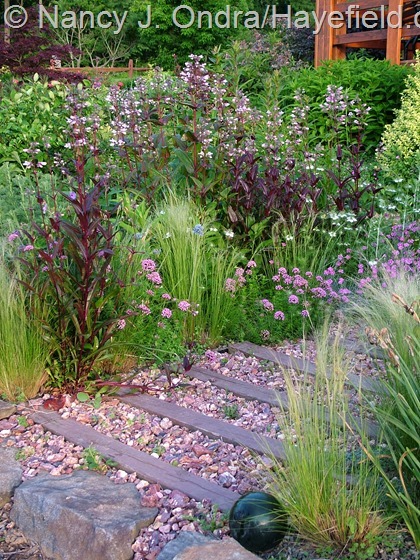 I just came back from a trip to the UK and your garden rivals anything I saw there…you do a wonderful job! High praise indeed, Barb; thank you so much! I’m sure you saw many wonderful things on your trip. I hope you had a super time! I just love going on your virtual tours. Thank you for sharing your incredibly beautiful and inspiring garden with us. Happy almost-summer, Dorothy! Thanks for taking the time to make a virtual visit this evening. Your garden continues to be one of my favorite works of art and that corn, WOW, gems. Wonder what led Native Americans to breed such beauty. I can’t wait to see how the corn turns out, Carole. I’m dying to know if it’s really that amazing, or if it’s yet another example of a few really good pictures stirring up hype about a plant. Time will tell! 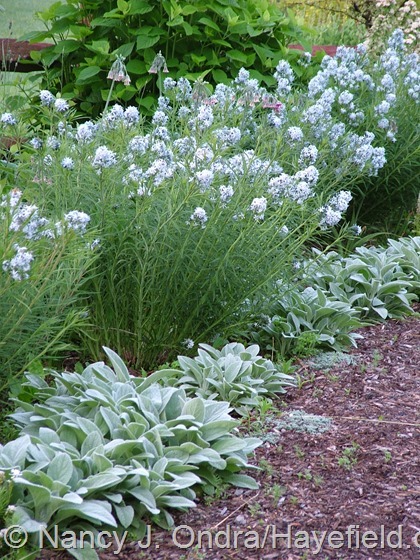 I’m really intrigued by your hard cut-back of perennials like Amsonia and Stachys at this early time of year when they look so lush and happy. I don’t recall noticing that being done in other gardens but it sounds like an interesting way to prevent that late summer floppiness. 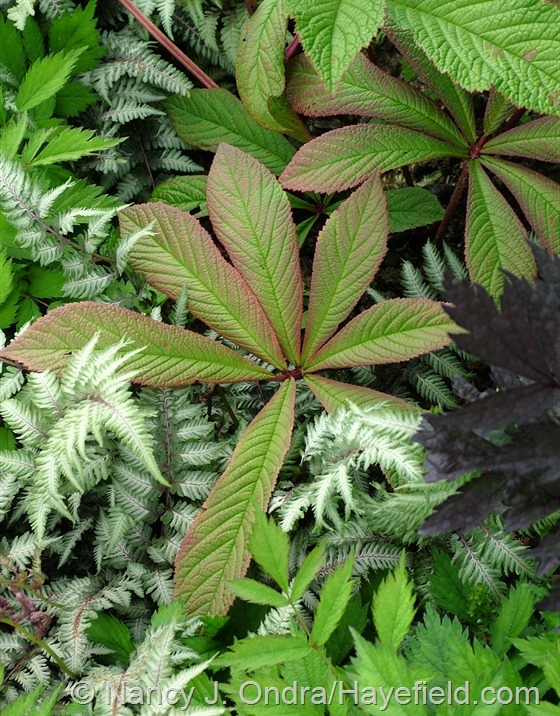 Regarding good foliage combos with Japanese Painted Fern, this April I was excited to relocate some Geranium phaeum – with its long lasting dark purple flowers & dark markings on the leaves – near the ferns which maintain early season flushes of pink and purple. A real nice dialogue….which I’ve perked up in May by studding a few annual bedding begonias (bronze leaves/rose flowers) amongst the ferns. It’s hard to do that harsh pruning now, Eric. If my priority was having the garden look perfect in early summer, I wouldn’t do it. But as I’m more interested in things looking their best from July to frost, it’s worth losing a few weeks of beauty now. Plus, it keeps the amsonias from seeding everywhere. 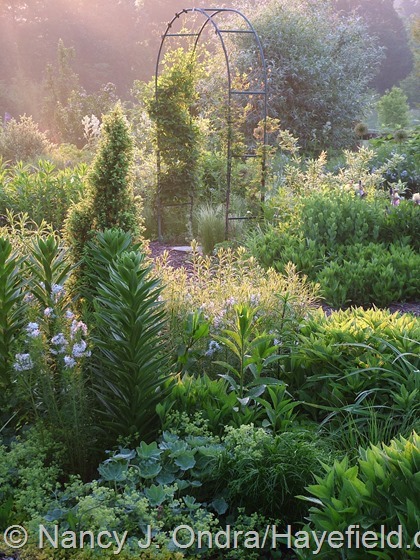 I do it the baptisias too, to keep them from smothering their companions; the sanguisorbas and some tall grasses, to keep them from flopping in bloom; and the rudbeckias and echinaceas to delay their flowering until later in the summer. I love your idea of pairing painted fern with Geranium phaeum–that’s inspired! That’s a super idea, Eric – thanks. I don’t know that I’ve ever deliberately planned a combination that way, but I’ll look through my archives and see what I can come up with. Or, maybe I’ll have to do some experiments over the next few years. Yes, I know lots of folks are drawn to “black” flowers, but they seem to disappear unless you can get really close to them. Besides foliage contrast, it can work if you have architecture or hardscape for contrast: I’ve got Daylily ‘Royal Occasion’ in front of a slate patio, for instance. That’s an excellent point. A light-colored wall or pale siding would work well, I imagine. Your mid-month posts always overwhelm me a bit and this month, despite your opening disclaimer, was no exception. I loved everything so it’s hard to pick a favorite, although the photo of the gooseberries struck me – they look like jewels. 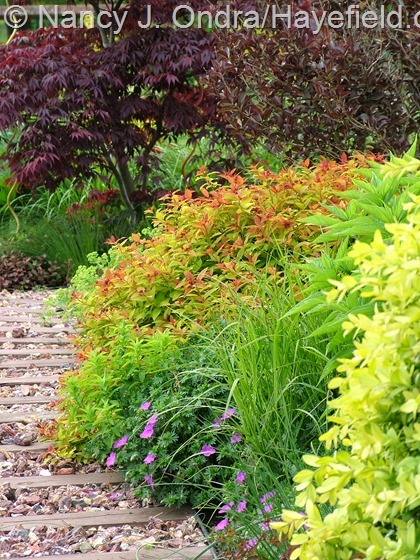 I was also particularly attracted to the combinations with the burgundy Japanese maple – after an excessive attention to flowers in my “new” garden, I’m paying more attention to foliage now. Thanks for the wonderful post! How fun that the gooseberries really caught your eye, Kris. They’re still a week or two from being fully ripe, but the fruits (and the leaves too) looked so pretty that I thought they deserved to be included. 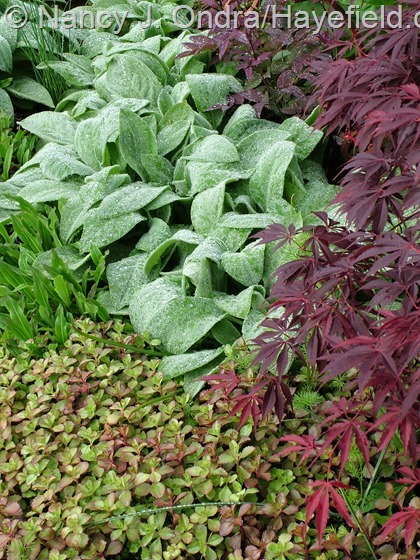 Have fun collecting some great foliage to complement your flowers. I go back and forth between the two myself. I am unable to locate the (Asparagus verticillatus)Do you have a source or seeds? Please advise. I love your postings, so beautiful and helpful! Hi Jan! Plant Delights Nursery sells Asparagus verticillatus plants (here). If mine sets seed this year, I’ll try to include it in my November giveaway too. Nan, you and your gardens are amazing! 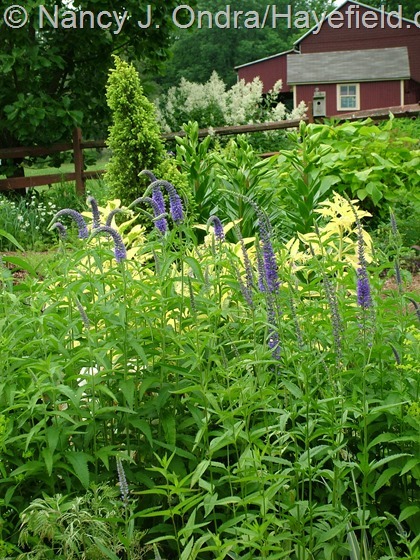 Several years ago I dived into gardening using “The Perennial Gardener’s Design Primer” as my master guide and friend. For that, I owe you my deepest gratitude. What a lovely thing to say, Kathleen! I’m so glad you found your way here, and I hope to have you as a regular reader. Happy gardening! Nan, wonderful views of your gardens again, thank you! What caught my eye was those big, healthy, lilies in one shot. Do you feed them-compost or such? I can just imagine the blooms they will produce, wow! 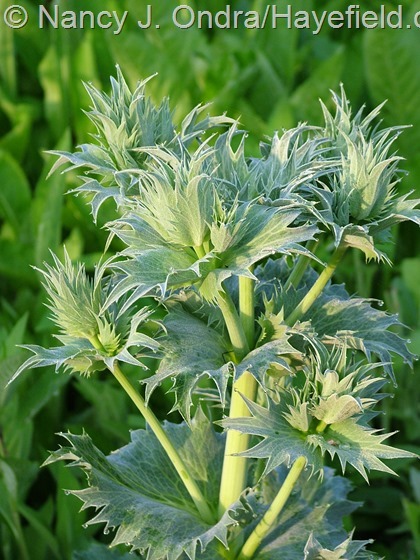 I’d also like to try the crosswort, providing it produces seed. Thanks for the offer! I can take no credit for the vigor of those lilies, Donna. 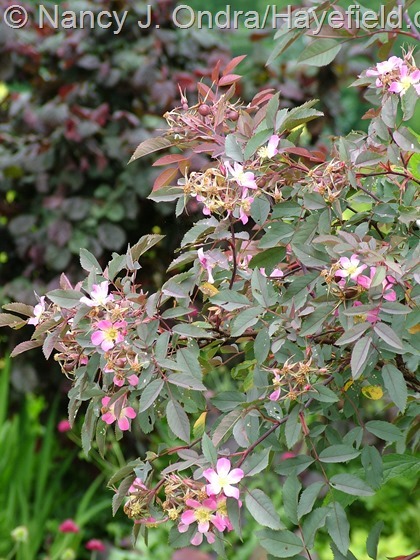 Their trunk-like stems are sturdier than many shrubs, and the amount of flowers is amazing. That’s ‘Conca d’Or’, an Orienpet lily. Wait until you see them in my July Bloom Day post in their full glory. I’ll put you on the list for those seeds, in case the plants cooperate. Nancy, I always enjoy your posts and photography. Thank you. Do you do workshops or give talks? If you are doing some in the future do you have a schedule? Thanks for stopping in today, Susan. Speaking is one talent I definitely don’t have, and I don’t travel, either. Fortunately, writing keeps me plenty busy at home. It was kind of you to ask, though. Inspiring, as always! 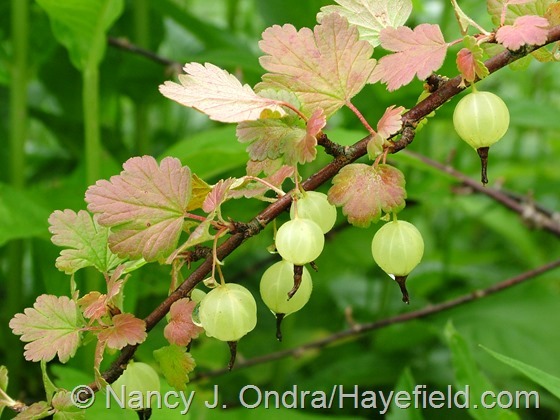 The photo of the gooseberries looks as beautiful as any of the ornamentals. I can’t wait to see the picture of your Conca d’Or lilies next month. 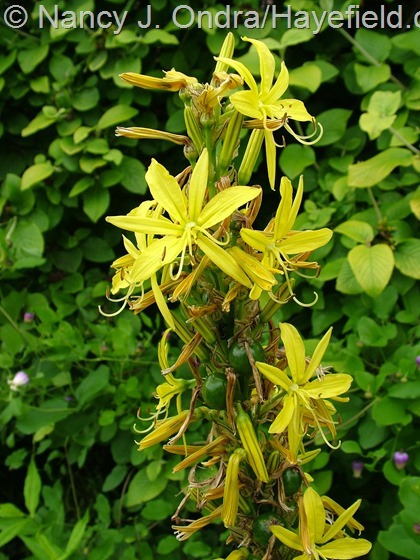 They–along with Muscadette–are my favorite lilies. Thank you for the generous offer of seeds. I’d love to try the swan plant and false hemp. I don’t think I have any seeds you don’t already have, but if I find some I think you’d be interested in, I’m happy to reciprocate. Thanks, Kristy! I’m not growing the swan plant this year, but I should be able to get the Datisca with no problem. I can’t wait to see your Conca d’Or lily, I have one as well but its not very established. Some of my other ‘tree lilies’ are well over 5 feet tall though ! Its too bad the Orienpet lilies don’t set seed. Have you ever tried digging up a lily bulb and scaling it ? 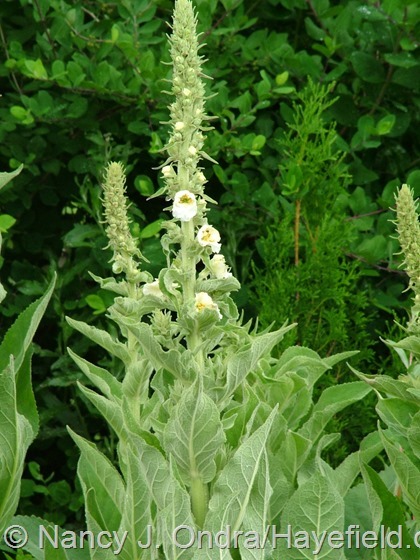 Your Verbascum are wonderful. Mullens seem to be hot right now. Here’s a picture of the ‘Southern Charm Hybrid’ Verbascum I grew this year. Such a pretty color on your mullein, Jesse! And about the lilies: yes, I’ve done the scaling, but not since propagation class in college. 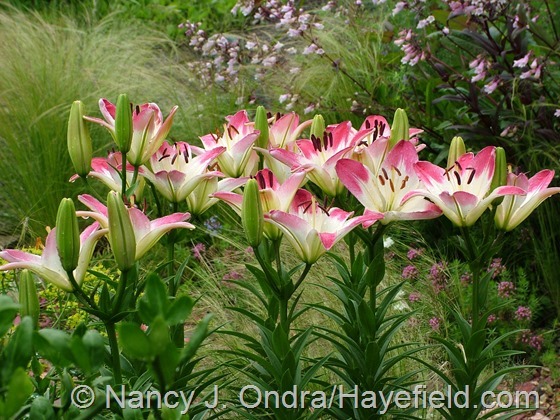 In general, I haven’t been a big fan of lilies…until I started growing the Orienpets, anyway. As always, I save your garden for dessert…the best for last! I can’t imagine how you can make yourself leave to go into town for groceries at the height of the season. Best wishes for great weather and good rains! What a delightful garden you have. Hi David! Thanks so much for stopping by. It really is hard to leave home, even just for a few hours, when everything looks so good. 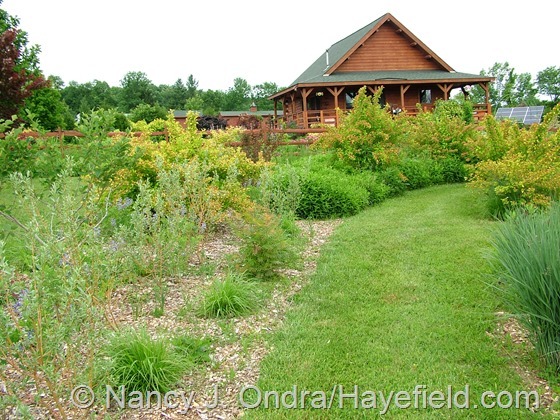 People ask me where I go for summer vacation, and most of them don’t get it when I say there’s nowhere I’d rather be than right here with my garden and my critters. I wish you a wonderful summer! You are definitely an artist. Love the golden hop-tree! Does it take full sun? I remember from your golden foliage series, that I still visit by the way, that you were thinking about coppicing. Did that work? You also pictured golden meadowsweet. I always wanted to try meadowsweet, but thought it might be a thug in my small garden. Yours is very eye catching to me so I must try. 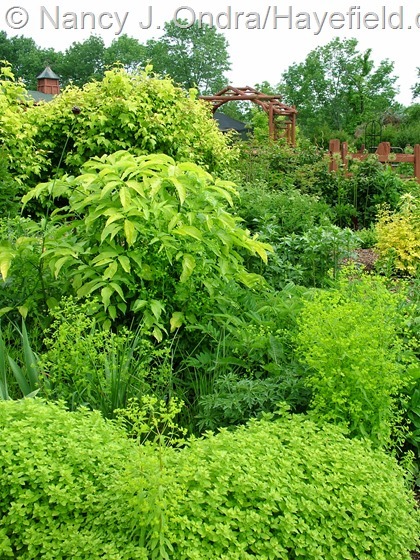 I guess I am very attracted to golden foliage plants and have mixed in a few lately, but by July, they seem be green. Oh well, I enjoyed the gold in May and June. Thanks for the tour! ps. If the hop-tree does seed, let me know. Hey, Greg. Yes, the golden hop-tree here is in full sun. I decided not to coppice it…well, actually, I forgot about my intention for a while, and by the time I remembered, the plant had filled out, so I didn’t want to bother it. It flowered heavily this year but I haven’t yet checked for seed; if I find any, I’ll make sure you get some. 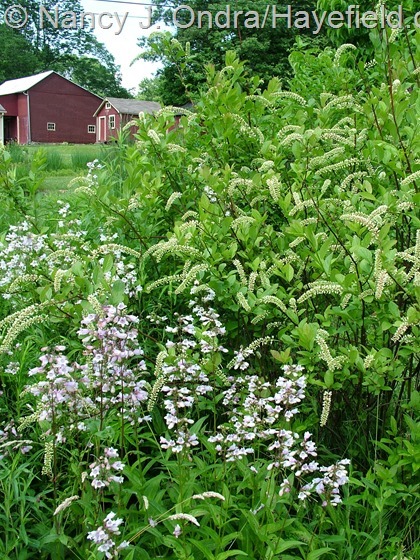 Definitely, give the golden meadowsweet a try. 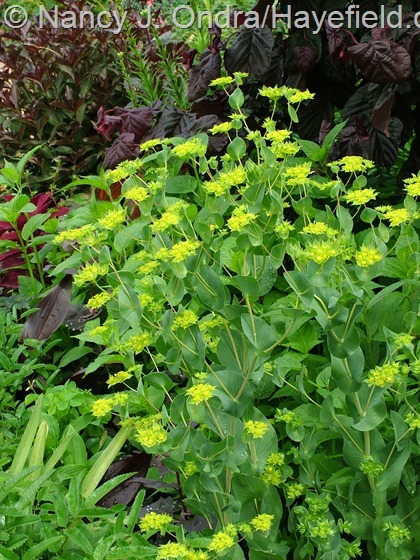 I have it and the not-very-variegated ‘Variegata’ growing about 4 feet apart out front, and the golden is only 18 to 24 inches tall and wide: about half the height and a third of the width of the basically green one. It’s still yellow, but also a bit crispy along the edges, because it’s in all-day sun. I usually would have cut it back by now to get fresh foliage, but someone asked for seeds, so I’m waiting to see if they’re going to develop.